Another Wednesday, another lesson. I admit, I wasn’t sure if I was going to be able to do this or not at first. But since I did, this week, we’re looking at getting yourself known. Lately, I’ve seen a lot of writers ask more well-known authors, “How do I make myself known?” Now, I admit, I’m not the most popular person out there, but as someone that has almost 3,000 likes on Facebook in under two months, I have a few tricks under my sleeve. I even got asked by someone what my secret was. My answer? Promotion, promotion, promotion. You have got to promote your work, but don’t just bang everyone over the head with it. (That could end badly…). So, how do you promote without hitting anyone over the head and spamming them with a bunch of links? Interaction! I admit, I spent quite a bit of money on Facebook ads, but not everyone does that, and still become popular. How do they do that? They interact with their fans. Respond to comments, whether it’s on Facebook or your website, or whatever. People like to see that. 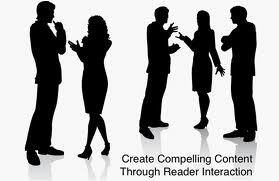 It shows that you like to get to know your readers. But guys, come on, use some common sense, don’t be rude. That will only make you less popular. Don’t do that. Be polite. Use your inside voice. Make readers want to keep reading. If they don’t like you, they won’t buy your book. You want your book to sell, don’t you? Well, you know what you should do. So, you haven’t been polite, or haven’t been interacting, start doing so. The more you interact, the more popular you become. Ready, set, go.